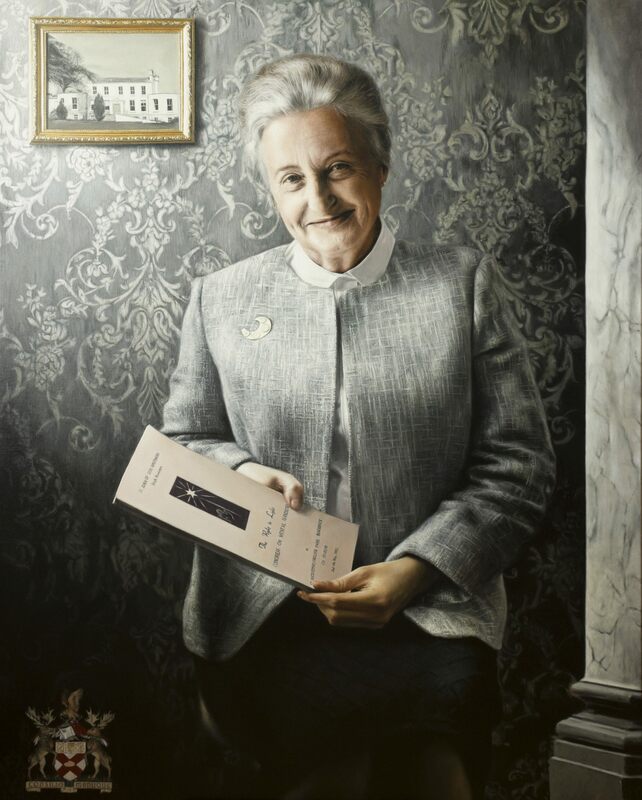 Barbara Maive Stokes paediatrician and disability campaigner, was born 20 December 1922 in London to Brigadier William Noel Stokes (d. 1969) and his wife Pauline Mary (née Reynolds). From 1933 she attended St Paul’s Girls’ School, Brook Green, London. After her father’s retirement from the Royal Army Ordnance Corps, the family moved back to Dublin (residing at Grianán, Baily, Howth) in the summer of 1939. Stokes matriculated to study medicine at TCD in September 1939. Graduating MB, BCh, BAO (1945), she trained as a house physician at the Meath Hospital in Dublin, with which many of her illustrious ancestors notably her great-grandfather Whitley Stokes and great-uncle Sir William Stokes were closely linked, most recently her uncle Henry Stokes. She was awarded a certificate in public health by UCD (1947), but her desire to become an epidemiologist was nullified owing to all positions in that field being within the public service, from which married women were then barred. Training under Dr Robert Collis at the National Children’s Hospital, Harcourt Street, Stokes commenced her paediatric career, strongly motivated to overcome the older generation’s failure to address adequately the needs of those with congenital physical and intellectual disabilities. She was appointed assistant physician to St Ultan’s Hospital for Infants (1947), and also worked at the Royal City of Dublin Hospital, Baggot Street. While Senior Demonstrator in Pharmacy and in Physiology in RCSI during the later 1950s, she developed a private paediatric practice, specialising in neo-natal work. She also led a fundraising campaign in the late 1950s to upgrade the facilities of the Liberty Creche in Meath Street, founded in 1894, which served the working women of the Liberties of Dublin, often catering for succeeding generations of the same family. Stokes promoted the Liberty Creche for the rest of her career and, perceiving the need to monitor new services as they were established, advocated a regulatory regime for those providing child-care services, nursery schools and creches through the 1960s. Patsy Farrell, the mother of a young child with Down syndrome, established with a group of volunteers in 1955 an organisation that became the Association of Parents and Friends of Mentally Handicapped Children. Stokes initially volunteered her services as part-time medical director of what became known as ‘St Michael’s House’, and eventually managing the entire organisation. In 1959 she established a medical advisory service providing nationwide assessment services, and in 1961 became full-time medical director and opened a day-care service for children with severe and profound intellectual disabilities. In 1967 a special care unit was opened in Ballymun for severely handicapped children, aiming to inculcate self-sufficiency and enable them to live as full lives as possible. St Michael’s House first clinic was opened in Goatstown (1968), staffed by a multi-disciplinary team of medics, psychiatrists, social workers and educational experts assessing the needs of each child. Exercised by the absence of non-residential services and supports for children, Stokes was an early advocate of community-centred provision of services and a sharp critic of the tendency to confine people in large institutions for life. While reluctantly accepting that residential care was sometimes necessary, she resented the prevalent assumption that it should be the first resort. In demand as a public speaker and expert on service provision, Stokes took every opportunity to champion the distinct needs of the parents and wider families of those with intellectual and physical disabilities, and contributed to the ‘Report of the study group on children’s hospital services’ (1972). She was a consultant editor to A long way to go (1978), a documentary produced by Strathin Enterprise Films examining the work of St Michael’s House, elucidating the medical, social and emotional issues facing young disabled people seeking to integrate with their communities. Tirelessly fundraising with Declan Costello (1927–2011) and others, she was unapologetically combative in her pursuit of government funding, and by the mid 1970s St Michael’s House employed over 200 staff and was largely funded by the state, with one-third of its budget coming from fundraising. She worked hard to develop integrated services at Cheeverstown House, the planned village development in Templeogue, Co. Dublin, a joint venture between St Michael’s House and the Eastern Health Board. In 1981 she received a People of the Year Award, and in 1990 the Rose Fitzgerald Kennedy Leadership Award. She was a life governor of Stewart’s Hospital, Dublin, patron of the Dublin Homeless Girls’ Society, a member (1976) and fellow (1978) of the RCPI, a member and president of the Irish Paediatric Association, and a member of the board of St Ultan’s Hospital (from 1980), the British Paediatric Association, the National Rehabilitation Board (1975–85), the Medico-Social Research Board (1978–84), the National Health Council (1985– 6), and the National Association for the Mentally Handicapped of Ireland (latterly renamed Inclusion Ireland). Remaining a consultant paediatrician to Baggot Street, St Ultan’s and Mercer’s hospitals until her retirement from St Michael’s House in 1987, Stokes joined the board of Cheeverstown House that year, working to develop services there. Barbara Stokes, who had endured multiple sclerosis for thirty-five years, died 22 March 2009. Construing intellectual disabilities as developmental disabilities, she dedicated her career to improving services for those with intellectual and physical disabilities in Ireland and strove to enable children, and their parents, to maximise their potential in the most suitable surroundings.